YHM .308 suppressor on a .223 rifle with quick-detachable barrel (since he doesn’t own a .223 can yet), Magpul BUIS, stock and Ranger plate. Normally, he uses a CCA light foregrip, but I replaced it with Viridian C5 for my needs. 1.5x ACOG is the primary sight. 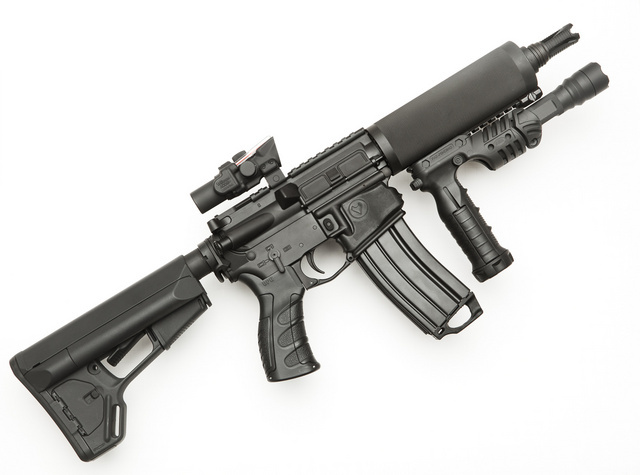 To my mind, this rifle would be a great candidate for a 300BLK barrel as it would make better use of the .30 caliber suppressor without much increasing the recoil. The rifle would be a lot quieter that way and throw twice as much lead per shot. The same rifle without the suppressor. This entry was posted in light/laser, rifle, sound suppressor and tagged 223, AR15, YHM. Bookmark the permalink. Your iron sights are on backwards man. Top picture.